Yang Yang, Chenhao Tan, Zongtao Liu, Fei Wu, and Yueting Zhuang. In Proceedings of the 32nd AAAI Conference on Artificial Intelligence (AAAI'2018). Unprecedented human mobility has driven the rapid urbanization around the world. In China, the fraction of population dwelling in cities increased from 17.9% to 52.6% between 1978 and 2012. Such large-scale migration poses challenges for policymakers and important questions for researchers. To investigate the process of migrant integration, we employ a one-month complete dataset of telecommunication metadata in Shanghai with 54 million users and 698 million call logs. 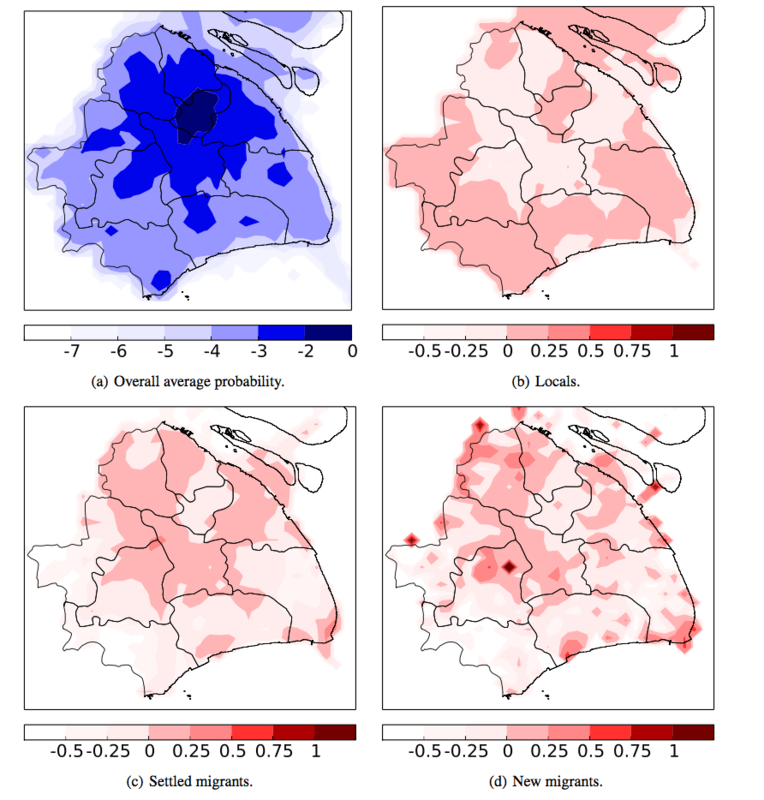 We find systematic differences between locals and migrants in their mobile communication networks and geographical locations. For instance, migrants have more diverse contacts and move around the city with a larger radius than locals after they settle down. By distinguishing new migrants (who recently moved to Shanghai) from settled migrants (who have been in Shanghai for a while), we demonstrate the integration process of new migrants in their first three weeks. Moreover, we formulate classification problems to predict whether a person is a migrant. Our classifier is able to achieve an F1-score of 0.82 when distinguishing settled migrants from locals, but it remains challenging to identify new migrants because of class imbalance. This classification setup holds promise for identifying new migrants who will successfully integrate into locals (new migrants that misclassified as locals).